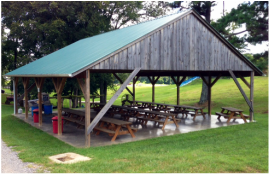 Our minimum party package is $250.00 tax included, which includes 1/2 of the pavilion and twenty five guests. Birthday person is FREE. $9.00 per child and/or adult after 25 guests. During Calendar Dates 'CLOSED' to the Public - Parties get 2 1/2 hrs in the Pavilion, and use of the play areas listed below during that time. During Calendar Dates 'OPEN' to the Public - Parties get 1 hr included in the Pavilion, and guests can stay all day until closing. This will include Pumpkin Patch, Hay Ride (plus Small Pumpkin), Farm Animals, and all of the play areas listed below. *Corn Maze not included. *Mail deposits to: Ann Linginfelter at 700 Pinecrest Cir., Lenoir City, TN 37772. Do not mail to farm location.